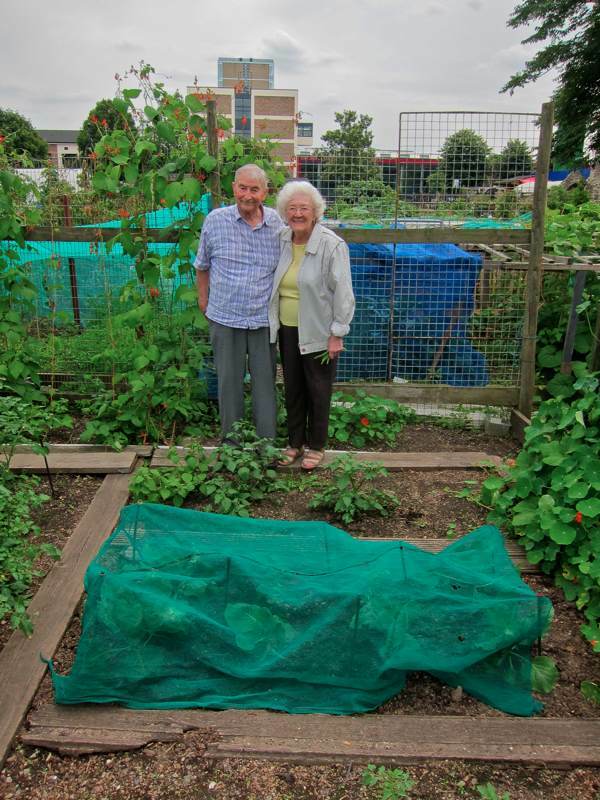 Fred Iles was born half a mile from his allotment in Stepney and his wife Marie grew up in Garden St that once stood where the allotment is today. 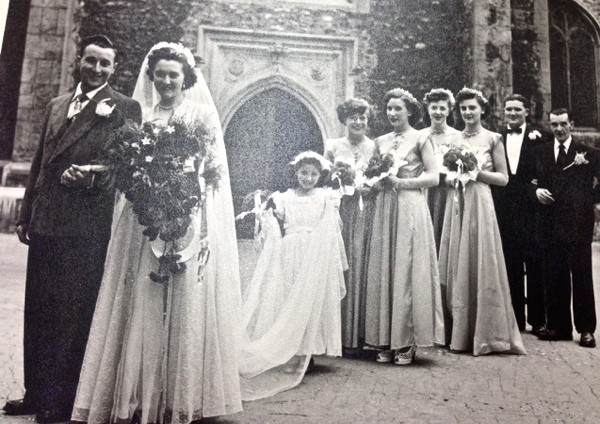 They were married in St Dunstan’s, just across the road, and today live fifty yards away in Rectory Sq. As for Smudge, she is a local too and gave birth to two litters in the allotment shed. 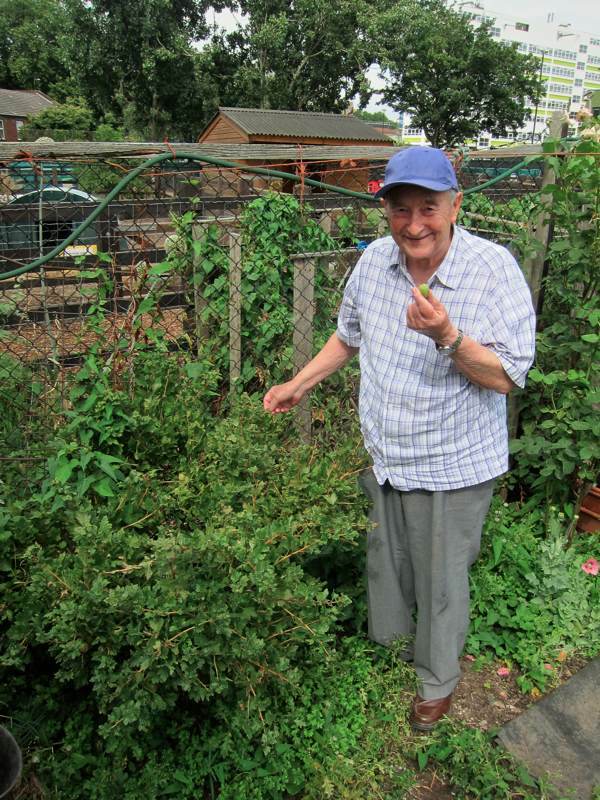 Fred grows potatoes, cabbages, strawberries, gooseberries, runner beans and nasturtiums to draw the bees in his allotment, which is a small enclosure at the heart of Stepney City Farm. Surrounded by on all sides by other plots, this is a secluded corner sheltered from the wind where Fred can pass his time gardening peacefully in the company of his cat. As gardeners will know, the growing season has been very late this year, but Fred had a good crop of strawberries and, as he was telling me his story yesterday, while boney old Smudge patrolled the territory, Marie searched among the runner beans and discovered the first pickable specimens of the season. “We never had a garden of our own. My grandfather Edmund lived with us when I was a child, he had come up to London from Bristol originally with two children and he ended up with four sons and three daughters. He was a great pigeon fancier and our backyard was all pigeon lofts where he kept three hundred pigeons – that’s a lot of pigeons. He was very successful at it and when he was dying he called me into his bedroom and showed me his box of medals and asked me to take one. I picked the silver one because it had a picture of a pigeon on it. There were gold ones I could have picked but I was too young to understand. He told me that Iles is a French name and that my ancestor fought in Napoleon’s army and was brought over to Bristol as prisoner of war and then stayed. I was born in 1926 just half a mile from here in Hartford St, in a little cobbled yard called Wades Place. My father William was a seaman in his younger days and he went all over the world. I don’t know how he learnt about classical music but he was very knowledgeable and he used to play the Gounod’s Faust and Viennese waltzes on his harmonica for me. I was here for part of the Blitz. It started on a Saturday afternoon at 3pm. I was in the yard and I heard the roar of the aeroplanes. I was thirteen and I thought it was our planes coming back, but it wasn’t. My father took me inside and we sat under the stairs which we thought was the safest place. I couldn’t see anything but I could hear the sound of the anti-aircraft guns and the engines of the planes and, at my age, I found it very exciting. 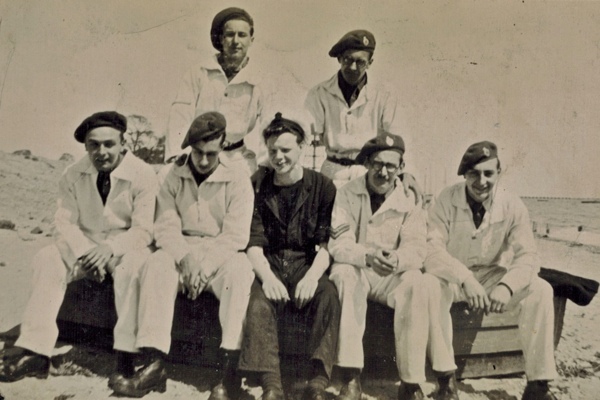 By the time they came back to bomb the docks, we had an Anderson shelter in the garden and we sat there listening to the sound of bombs dropping. 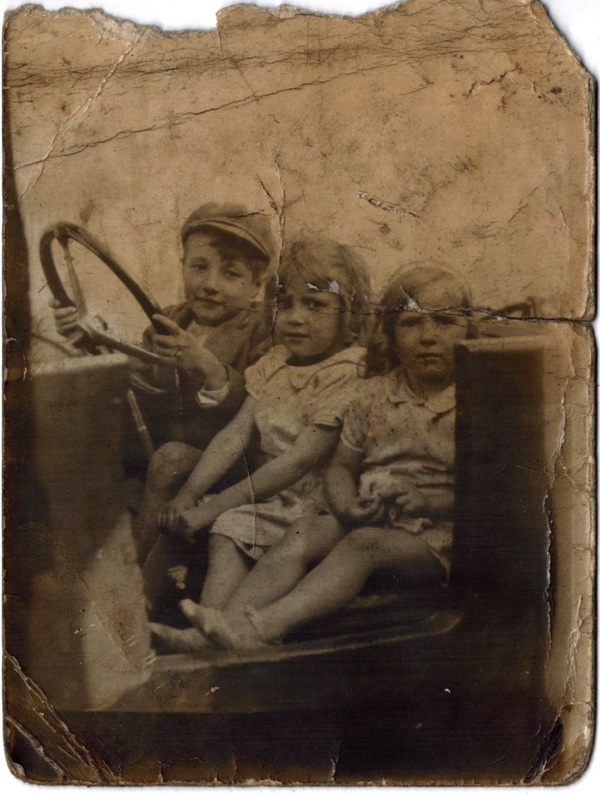 My father decided it was too much and sent me and my mother and my sister to his brother in Oxford. 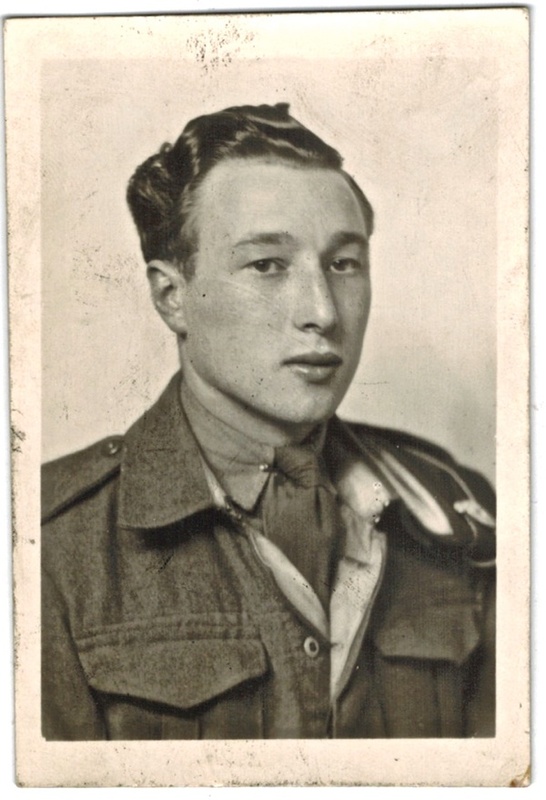 He worked in the Morris factory which, at that time, was building aeroplanes and he got me job at fifteen making cowling panels for the side engines of Hawker Hurricanes. It was exciting work but it was miserable waiting in the cold for the bus to go to work at seven in the morning. 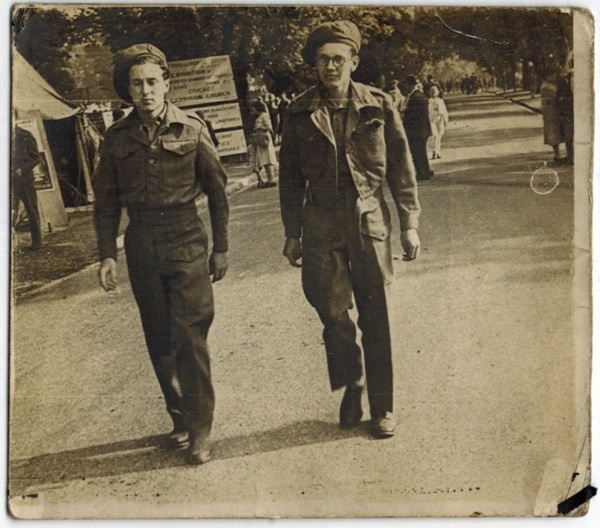 I got called up to the army on D-Day, June 6th 1944 and I was eighteen years old on my birthday, 30th June. They summoned me for 20th July, the day they tried to assassinate Hitler, so I had three weeks freedom before they put me in the army. By the time I’d learnt to shoot a gun, for some unknown reason they put me in the Royal Electrical Mechanical Engineers. 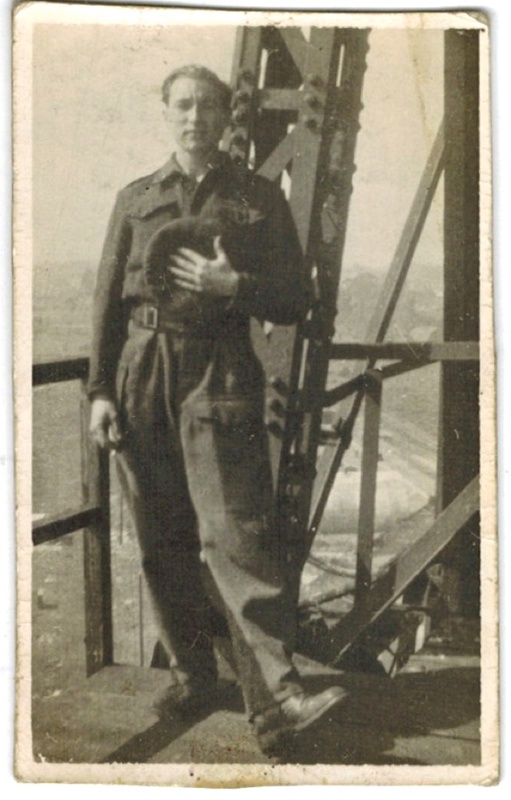 I was posted to the anti-aircraft guns around London and then they sent me to an experimental laboratory in Shoeburyness where they were working on radar. 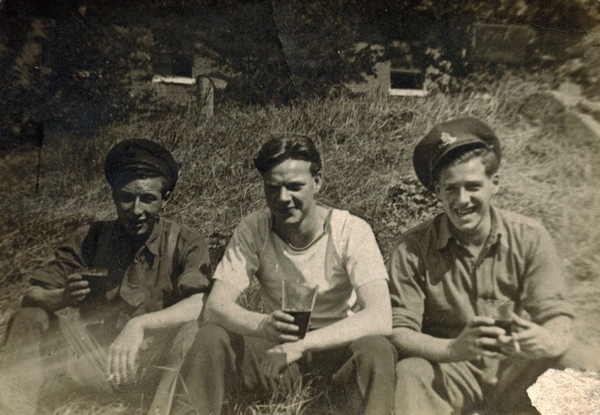 I found I had an easy time for three and a half years until I was discharged in 1947. I went to the Labour Exchange and the man said, ‘There’s not much going but I like the look of you so why not come and work on this side of the counter? And when a good job comes in you can get it.’ I worked there for six months, and my father was unemployed and he came in and signed on the dole. After six months, the London Electricity Board came along and I worked there for twenty-six years, at first in the office and then as a meter fixer. Fred stands at the base of the aerial in Shoeburyness. 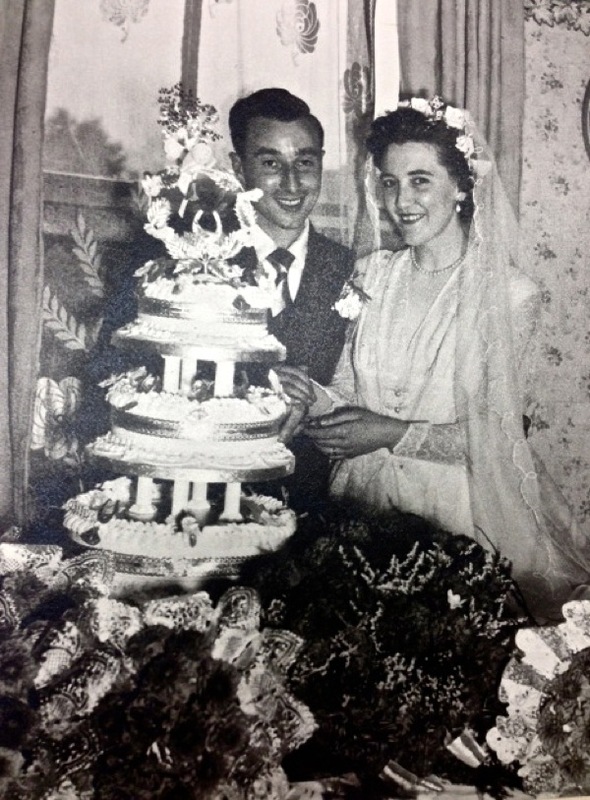 Fred & Marie on their wedding day. 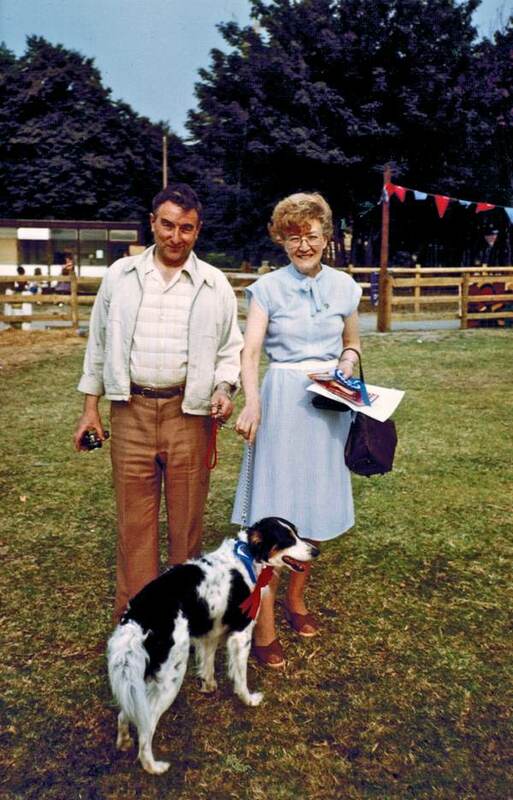 Fred & Marie with their prizewinning dog Rufus, in July 1984 at Stepney City Farm – when Rufus won the dog with the waggliest tail and best mongrel. Beautiful wedding photographs. Thank you. Miaow! Sisterly greetings: you did well to pick an allotmenteer. They’re generous and reliable. I know because I did the same! What a beautiful story, thanks for sharing and thanks for helping make the Farm the wonderful place it is. 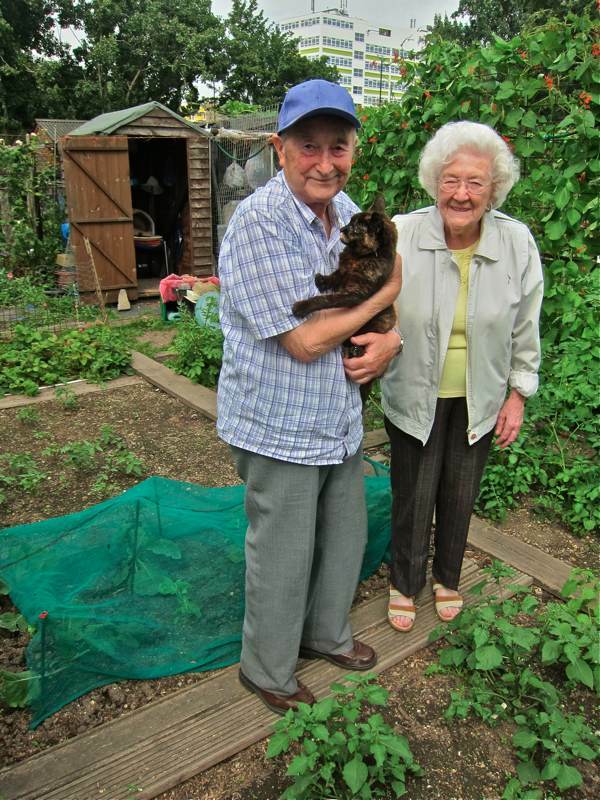 Congratulations to Fred and Marie on their 60th anniversary. 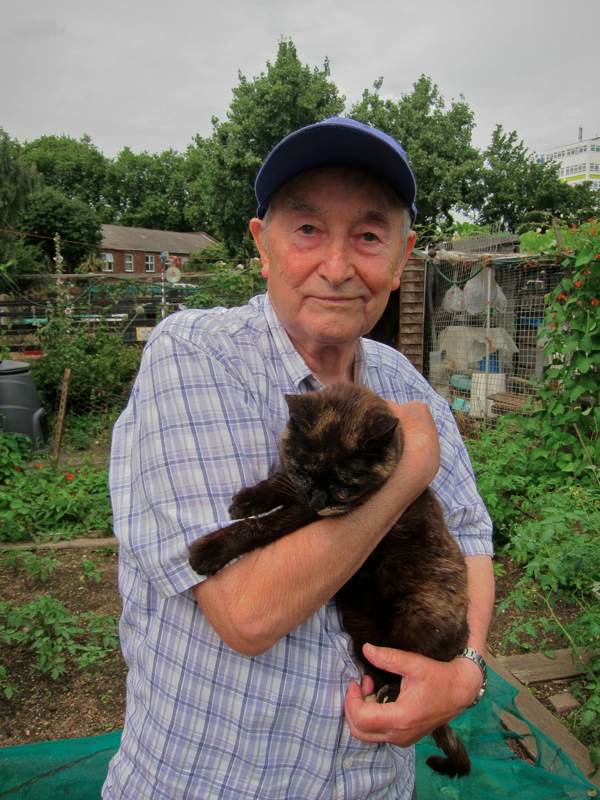 Lovely story and photos, and lovely Smudge, one lucky cat. 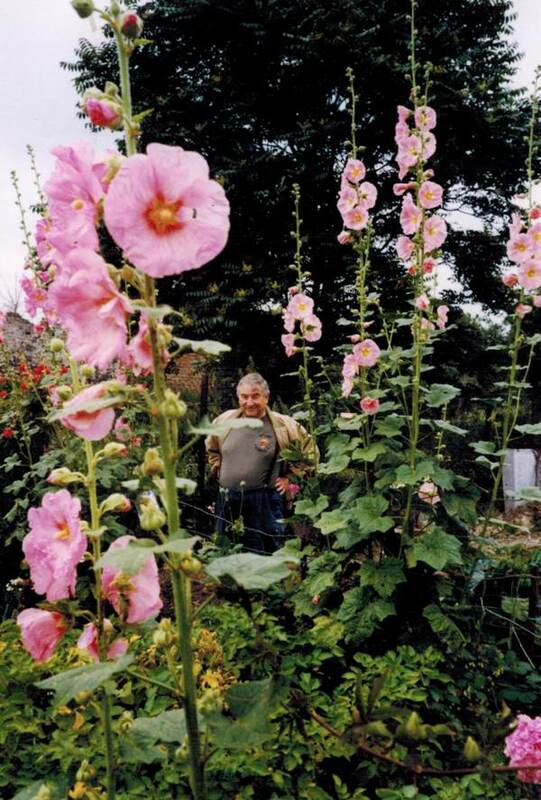 Lovely photos and garden – thank you for letting me share them. Thank you very much for this. Incredibly moving stuff. 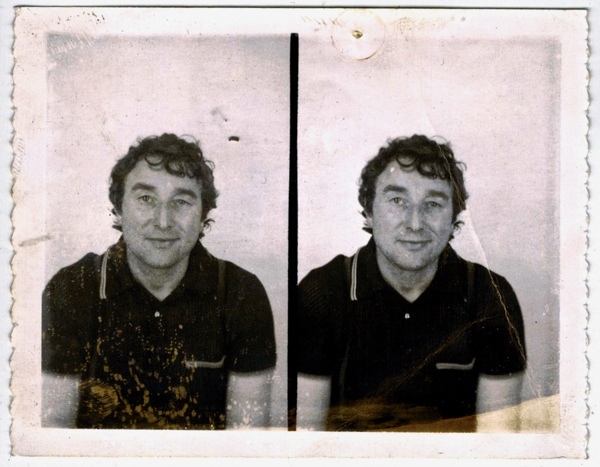 Frankie Howerd was also based at Shoebury – as a gunner. Wonder if Fred ever crossed paths with him. Frankie used to return to the area to test out new material at the Palace Theatre, Westcliff. Wonderful. Not much more I can say. I think this is a delightful story, beautifully photographed, beautifully told. long may you continue Fred and Marie , a happy full to brimming life , keeping young by being busy and productive and appreciating the small things in life , feeding smudge every day what a lovely profile . It’s been my pleasure to yell ‘EYUP Fred!’ in broadest Yorkshire everytime our paths have crossed over the past four years, and he’s never failed to smile and quietly say ‘ello or ‘awright’ back in pure Eastender. He’s a lovely bloke and truly the heart and sole of the place for me. Here’s to many, many more years of ‘our’ Fred! What a lovely story!Smudge looks much sleeker now in the second picture,a lovely couple,Happy Anniversary to them! 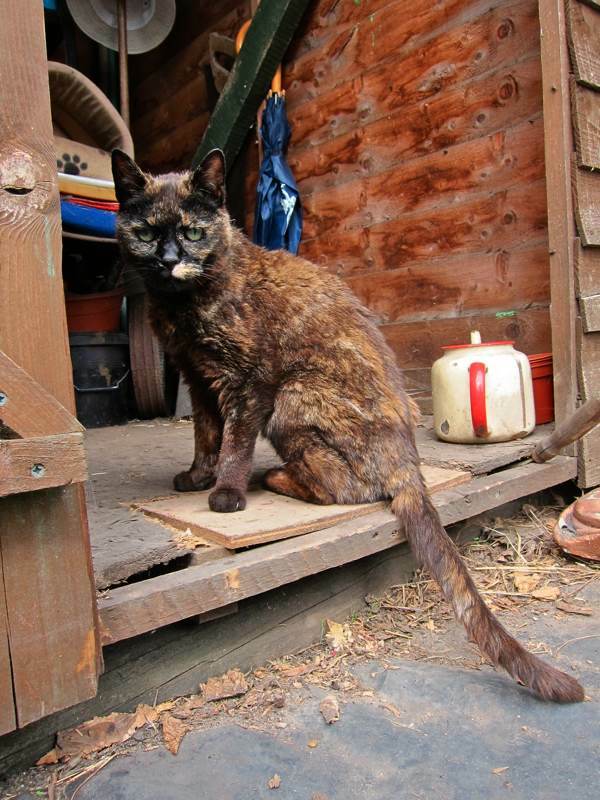 Thank you for sharing your story and photo’s, Smudge looks like a lovely cat. I’m not being rude but is there anyone to take care of Smudge when you or your wife die, if not you should have someone inform the RSPCA, so Smudge can still live a long happy life.